We actually drove into Southern Utah, parked the RV near Bryce Canyon NP yesterday and then drove to Zion for the day. Here’s the video that summarizes what I have blogged about below. The first of The Mighty 5 National Parks in Utah that we visited was Zion! These parks – Zion, Bryce Canyon, Capitol Reef, Canyonlands, and Arches – are collectively known as The Mighty 5. I’ve done my research and planned out our next two weeks down to the minute so we can see as much of these 5 parks as possible. We met a few folks that do all 5 in 5 days or less, so it’s doable but I want to enjoy the hiking at Bryce and Arches for more than a day. As we drove into Zion National Park, it looked like we are at the bottom of the Grand Canyon. This park is distinguished by it’s steep red cliffs of colorful sandstone that rise to the sky. Kolob Visitor Center was closed during our visit so we just visited the south part of the park. We drove into the park on Hwy 9 (Zion Mount Carmel Hwy) through the East entrance. We were first greeted with the Checkerboard Mesa. We continued to drive into the park on the red asphalt which helps blend in with the red stone but it is also cooler than the black so it helps with the heat of the summer. Coming through this entrance you are able to drive through the mountains via two tunnels. One of which is so narrow that they have height and width restrictions and they may need to shut it down for one way traffic if you are larger than car (they charge you do to this). We just had the Jeep so we were good. The RV is back at a site outside of Bryce Canyon, the next NP on the Mighty 5 list. As we drove through the mile long tunnel we got a glimpse of the canyon through cut outs. This national park is unusual because from Spring to Fall you must park at the visitors center and then ride the shuttle to all the stops. You must know this ahead of time so you can plan accordingly. It takes 45 minutes to ride from the visitors center to the last stop. We packed our lunches, snacks, water shoes, hats, sweatshirts and plenty of water (there are a few water filling stations) for the entire day. After picking up our maps, getting our Junior Ranger books, and using the restroom we stood in line for the shuttle. We rode the shuttle to the last stop #9, Temple of the Sinawave, so we could start our hike at the Riverside trail. This walk is easy along the Virgin River, the river that runs through the Zion Canyon. The Riverside trail (1.1 mile one way) ends at a slot canyon and the Virgin river becomes your trail, with little dry land on the sides, most of the time there is none. This is the heart of the Zion Canyon. The Zion Narrows, has been rated one of the top ten hikes on Earth. It has been called the granddaddy of desert slot canyons. Walking through slot canyons is awe inspiring, I’m reminded of our Earth’s long geologic history. We changed into our water shoes (we just wore old sneakers- you can rent special shoes with little wet suits for your feet) and waded in knee-deep cold water (50 degrees) into the narrowest sections where 18 million years of river erosion has cut 1500-foot walls into the earth. You have to check the flow and depth of the water online or at the visitors center before you hike the Narrows. Today the water was flowing at 70 cfs so we felt good about going out there with the girls. The main thing we were worried about was Mackenzie because of her height. The water was up to her waist at times, but mostly just her knees. They do advise you of flash flood warnings before you hike out there because they can sneak up at anytime. We’ve learned that the weather can change very quickly here. We hiked for an hour and half before finding a great spot on the rocks to warm up in the sun as we ate our lunch. We really have had the most amazing picnic spots on this adventure, I should do just a blog post with all the pictures of the coolest lunch and dinner views. There are no trial markers along the way but we looked at map in the VC and think we walked to Mystery Falls and then to Narrows Alcove. The canyon continues to get narrower as you hike further. You an get a permit to hike the full 10 miles (there is also a 16 mile overnight trail) but we only had one day in this park so we were just sampling part of this hike. We were able to see many weeping rocks with hanging gardens along our hike through the Narrows. After walking back to beginning of Riverwalk trial we hopped on the shuttle and got off at stop #7, Weeping Rock, the largest of the hanging gardens. This is a cool rock alcove with dripping springs. This is a short (.5 RT) but steep hike, well worth the stop. You can stand in the cove and listen to the water trickle down like rain drops. The temperature had risen so the girls were a little hot so they cooled off in the water. Our next stop was the Grotto Trailhead, stop #6, to access Angel’s Landing. Luckily, Angels Landing had just opened back up from a flood back in July. This picture is after walking 2 miles up hill! This 5.4 RT trail is strenuous with an elevation climb of 1500 feet to the top. The girls were struggling on the way up (it was 2:00 pm with the sun beating down on us and we had already been hiking since 10:00 am) until we met Mr. Mike, from Canada. He was an true Angel and helped distract us from the climb. This trail is not for the fearful of heights. We all made it through Refrigerator canyon and to Walter’s Wiggles with 21 switch backs! Thigh burn! After Walter’s Wiggles, we experienced the first of the chains! We’ve never been on a hike where it was so steep, slick and on the side of a rock that they have steel chains embedded in the rock for you to hold on to. I felt comfortable taking a picture right here because the chain area wasn’t so steep. Other’s I was holding onto to Mackenzie. We stopped at Scout’s Landing to take in the view and contemplate going further. 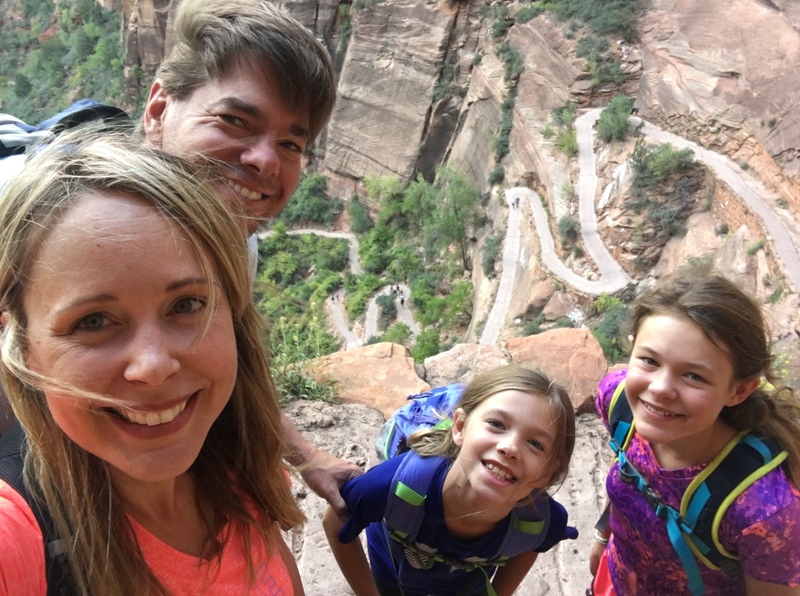 Knowing the fact that 7 people have fallen to their death on this trial in the last 14 years, the most recent was a 13 year old back in February, Chris made a family decision to not hike to the very top of Angel’s landing. It was super windy but we did hike a few more minutes along the chains to get a feel for it and watch people ascend the last 400 feet. That was long day of hiking! We hiked over 10 miles; some of those miles were through freezing river water and some with an elevation climb of 1100 feet so we decided to stop at Zion Lodge for dinner and ordered ice cream as our appetizer. Kenzie and I enjoyed the soup and salad buffet. The Red Rock Grill is the only place to eat in Zion NP. I forgot to mention another famous rock formation to oo and awe over; The Court of the Patriarchs is a set of sandstone cliffs that are named for biblical figures Abraham, Isaac and Jacob. The sun was setting as we neared the visitors center. We were exhausted, running out of daylight and still had an hour and half drive home so we skipped the Watchmen’s trail. Sunset view from parking lot. Goodbye Zion, I can’t wait to meet your 4 park neighbors!